Maserati unveiled the beautiful, all-new 2013 Quattroporte at the 2013 Detroit Auto Show, but the real news was CEO Harald Wester's emphasis on the brand's imminent takeover of the luxury market. 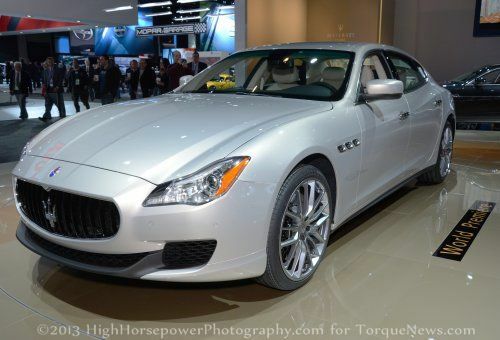 A few minutes ago, Maserati officially unveiled the all-new 2013 Quattroporte luxury sedan, bringing in the sixth generation of this trend-setting sports sedan. While the engine configurations and vehicle details were already well-known, the real emphasis from Maserati's CEO in Detroit was on the company's aggressive plans for market penetration. If the beautiful style and powerful underpinnings of the Quattroporte are any indication of what's to come with the company's two promised future models to complement it, then the other players in the high luxury market do indeed have something to worry about. The new Quattroporte is longer, wider, lighter, more powerful, more fuel efficient, and faster than its already-impressive predecessor. With design by Centro Stile Maserati under the direction of the legendary Lorenzo Ramaciotti and engines made exclusively by Ferrari, this new Quattro is at the top of the game. The new twin turbo 6- and 8-cylinder engine configurations had already been released in December, along with photography to show off the 2013 Quattroporte's powerful new styling. The sedan is ten inches longer, three inches wider, and has a top speed of 191 miles per hour (with the V8). Yet it's 220 pounds lighter, retains its 50:50 weight balance no matter the powertrain, and has a new class-leading 8-speed transmission. Ferrari's new V8 powerhouse is only 3.8 liters, lowering emissions by about 20%, but it manages a breathtaking 550 horsepower with 39% more torque than its predecessor. The V6 is equally impressive at 410 horses and 550Nm of torque. The real news, as mentioned, is that Maserati has aggressive plans for market dominance. Currently, the company builds only a few thousand vehicles a year, but from now through 2015, the company will be more than quadrupling its production. The company has been beefing up supply chains, improving distribution networks, updating its production facilities, and will now be hitting it hard with marketing to push the new Quattroporte as well as the two future models coming soon. This plan will, Wester says, move the company from its small sub-20% market share at current to more than 60% in the next two to five years. Looking at this beautiful new car and all of its groundbreaking technology, one might conclude that they have a good chance of pulling off that aggressive growth strategy. The 2013 Quattroporte design and build website is now live at MaseratiQuattroporte.com.